This site is devoted to people who are searching their roots in this nice part of Germany. The title of this first page (of over 20 you can find at this site) is derived from a publication of Ruckgaber (1875) ("Geschichte der Frei- und Reichsstadt Rottweil"). Of course, if one refers to these times today, the name of this former independent city state within the Holy Roman Empire of German Nation is more often called "Freie und Reichsstadt Rottweil" - which means essentially the same. But only this welcome page will bear the title "Frei- und Reichsstadt". 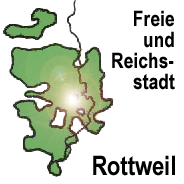 Because newer researches have shown that the labelling of the Reichsstadt Rottweil as "frei" is problematic anyway (as "Frei- und Reichsstadt" like as "Freie Reichsstadt"), so the following pages will bear the undisputed title "Reichsstadt Rottweil." Under the topic "Location and Territory" a description of its location will be given and the extent of this city state will be explained; it contains some information about the previous Oberamt Rottweil (not available yet), the present day Landkreis Rottweil, the villages and parishes that belonged to this mini state. Under the topic "History" you will find a short history of the Reichsstadt Rottweil and perhaps in future also information of emigration. The chapter "Sources" will tell what is printed; e.g. a bibliography, "Heimatbücher" (local history books) of the villages. Also placed here are transcripts of old documents, e.g. several Musterungsrollen (military inspection lists) and a tax book, that will provide you with a lot of surnames. It is planned to expand this section with other old documents. Beyond that you can find information about the parish records and their beginning years. The section "Links" is empty at the moment.